If you are looking to buy a puzzle as a present for a toddler, you have done well! Puzzles are not just mere toys…they are actually great tools for young kids to build important skills. Why Are Puzzles Important for Toddlers? Puzzles require kids to use logic to figure out where pieces would fit. For example, what should the picture look like? Puzzles encourage children to analyze what pieces are in front of them, what may be missing, what shapes would match, what colors would fit together etc. Puzzles can be challenging and this will teach a toddler about problem-solving. For example, if a particular piece doesn’t fit, where else might it go? Puzzles require fine motor skills as kids have to manipulate, rotate and direct pieces into their positions. Puzzles train kids to make observations from what they see and decide what is the next best course of action to complete the puzzle. Visual-perception skills are important for other later skills such as reading, spelling, handwriting, copying information from a board, math, understanding symbols, read signs, comprehension, interpreting maps and finding objects. Spending time working on a puzzle builds hand-eye coordination as kids will need to use both their sight and fingers when working with the puzzle. Completing a puzzle requires both left and right brain work. For example, imagination, matching color with color, shape with shape and thinking-out-of-the-box to work out where pieces will fit in. Puzzles teach kids about patience. It’s vital that children learn that some rewards take more time than others. If you have ever tried to do a challenging puzzle before, you will no doubt have experienced how important patience and perseverance is in helping you to complete the puzzle instead of giving up halfway. Intense focus is normally needed. Even if your toddler may get distracted easily, the practice of focusing on working through the puzzle will help to increase his or her attention span. Puzzles also help toddlers to improve their attention to detail. Your toddler has to learn to notice the little details on each puzzle piece to work out where they truly fit in the big picture. When children come together to work on a puzzle, social skills such as learning to take turns, communication and teamwork skills will be forged. Imagine if your toddler finishes a particularly difficult puzzle- he or she will experience the satisfaction of completing it. At the same time, his or her self-confidence will be bolstered when he or she realizes that he or she can work through difficult problems. In addition, you can also use puzzles as a teaching tool. There are multiple concepts that you can tease out of puzzle-playing. For example, you can explain how each piece is needed to complete the entire puzzle and thus plays an important role. As much as we wished we could say that your toddler will definitely take to puzzles like duck to water…this is not always the case. Some kids just love puzzles and some others need more persuasion. Don’t fret though, you can play a role in encouraging your toddler towards puzzles. For example, you could get a puzzle set with pictures that you know your toddler will love. Does he or she love animals? Or dinosaurs? Or maybe is a fan of My Little Pony? There are puzzles for all of those! So let your toddler choose the puzzle himself or herself. He or she is more likely to want to complete it if he or she gets to be involved in choosing it. Don’t worry too much about if your toddler chooses a puzzle that is too easy or difficult for his or her development level. If it’s too easy, your toddler will probably just dive right into completing the puzzle. If it’s too advanced, you can save the puzzle until your toddler is ready for it. So despite the fact that puzzles are mainly a personal choice, based on your toddler’s preferences, we do really like these ones. This is a great starting puzzle for young toddlers. It comes with big, chunky puzzle pieces to make it easier for toddlers to figure out and to hold. 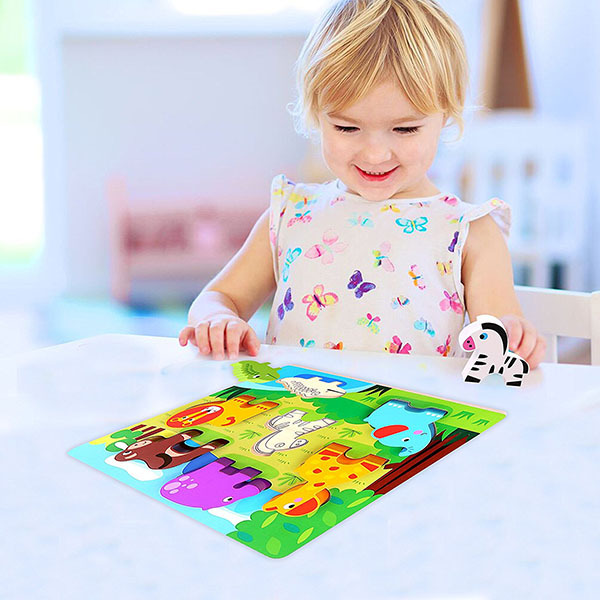 The puzzle features 7 animals; an alligator, lion, zebra, giraffe, elephant, hippo and monkey. If you have a young toddler who loves animals, this would be a great set to get him or her. 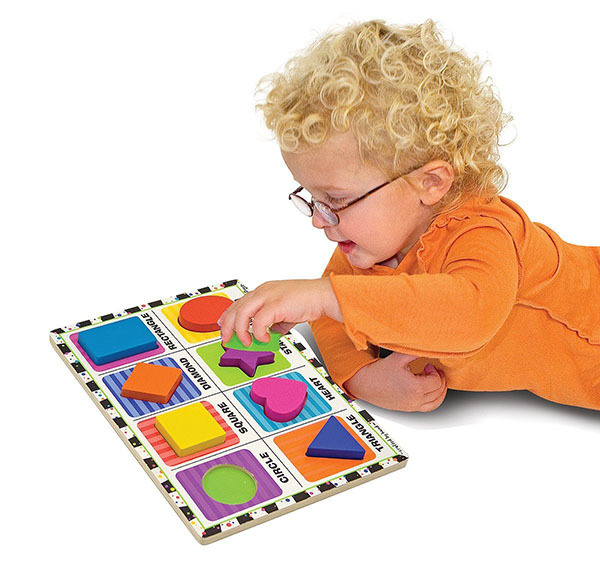 The colors are bright and the puzzle is designed so that the pieces can stand up as well as lie down on the puzzle board. 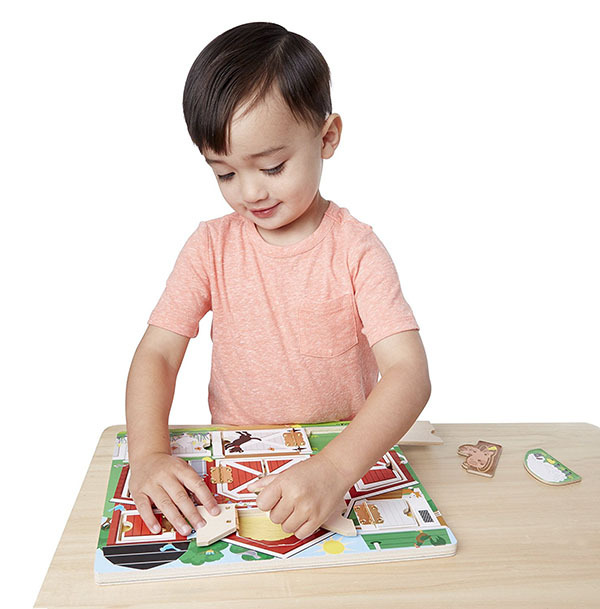 The puzzle is made of non-toxic solid wood and is made with smooth edges. A safe puzzle for toddlers to engage in without the need for supervision. This puzzle is simple but we love it because it teaches shapes- 8 of them. It uses bold, attention-seeking colors and patterns that are great for visual stimulation and is large enough for small fingers to grasp easily and manipulate. Great puzzle for young toddlers to start with. Just like the Wooden Puzzle – Animal Chunky, these puzzle pieces also can stand upright on the puzzle board. 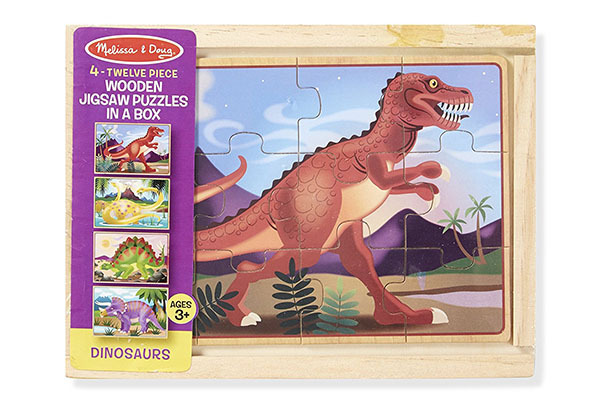 The Melissa & Doug-Wooden-Activity-Board is a great puzzle gift. It not only has red and white colors that remind you of Christmas, but the board comes with 9 doorways/windows that open up to reveal extra puzzle piece surprises. If you have a toddler that loves opening and closing doors and windows, this will be the perfect puzzle set to get your toddler. These pieces and the board itself is also specially made to be magnetized. Your toddler may still be in the phase of loving to throw the puzzle pieces from the board all out on the floor. The magnetized pieces encourage toddlers to stay with the puzzle longer because they don’t all fall out easily. This is also great if you want to reduce the number of times you end up picking puzzles off the floor. 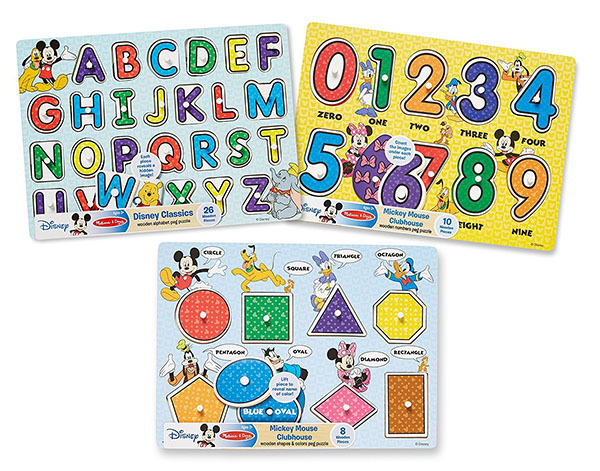 If your child is a Disney character fan, there are different Disney characters featured on the puzzle boards including Mickey Mouse, Minnie Mouse, Goofy and Daisy Duck. This set is good value for money. It comes with 3 different puzzles- one with alphabets, another with numbers 0-9 and the third, shapes. These puzzles provide you with a good teaching tool to introduce these concepts to your child. All pieces come with tiny pegs to make it easier for small fingers to hold. This is such a beautifully-done puzzle piece set, but for more mature toddlers. The puzzle pieces are chunky cubes (1.75 inches) so that your toddler can easily hold and manipulate them. This set is more challenging to figure out because the pieces are all the same size- cube shapes. The great news is that these puzzle pieces have different pictures on each side so that you get a 6-in-1 puzzle piece. There are 16 cubes altogether that rest on a wooden tray. Great value for money again! 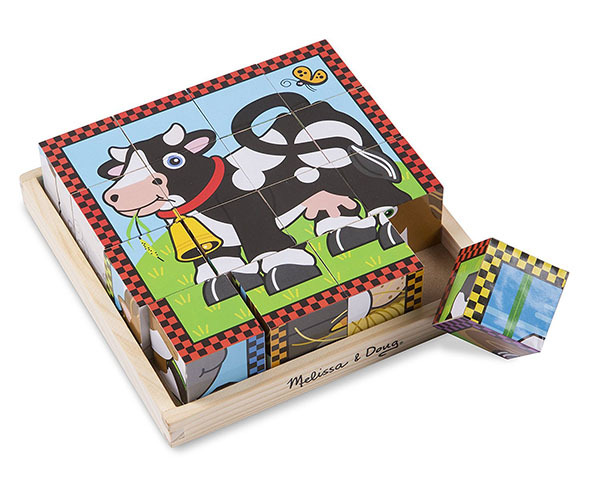 We also love the cute animals of each puzzle; you get a cow, pig, horse, sheep, chicken and duck. Popular animals that will hopefully encourage your toddler to stay with the difficulty level of this puzzle set. The borders are also color-coded to provide some guidance to your toddler in figuring out the pictures. If you are a love adult jigsaw puzzles yourself, this puzzle set is a great way to transition your toddler to jigsaw puzzles in the future. Because these pieces are all cubes, they make nice stackable blocks too. This puzzle set is great for keeping puzzle pieces neat and tidy as it comes with its own storage box. This makes this set great for use on-the-go. The storage box is divided into 4 parts so that you can keep the puzzles in their own separate compartments. We especially love the dinosaur pictures that come with this set- a Triceratops, an Apatosaurus, a Stegosaurus and a T-rex. If your toddler is fascinated by dinosaurs, he or she will love these as a present! Each puzzle board comes with 12 pieces. We absolutely love the Joyin Toy 4 in 1. These are a different sort of puzzle but it still builds logical thinking, analytical skills, shape matching and fine motor skills. It is made up of 4 different puzzles. Your toddler gets to learn about shapes, colors and even start building up IQ power by playing with tangram puzzles. 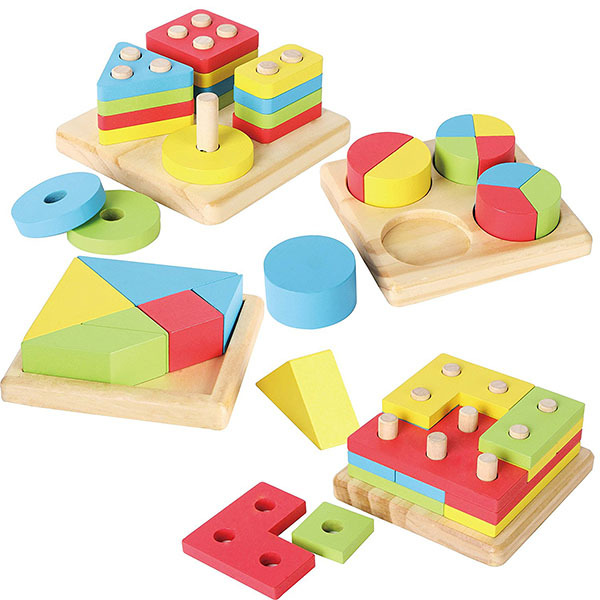 Tangram puzzles are challenging even for adults so even you can play with this set. If your toddler is not ready yet for the tangram, just keep it until your toddler is a bit older and ready for the mental challenge. We hope that this list has helped your search for the perfect puzzle for your toddler less puzzling!